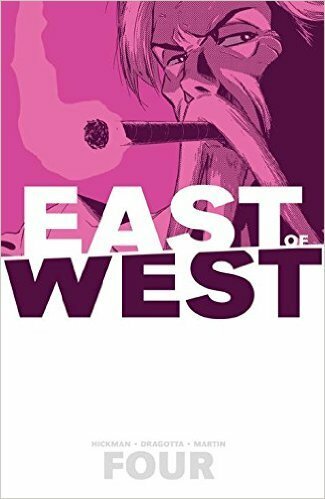 East of West Vol. 4 - купить по выгодной цене | Магазин комиксов "Двадцать восьмой"
Volume 4 of the Eisner-nominated, best-selling EAST OF WEST is now here! "THE APOCALYPSE: YEAR TWO” begins! Following the dramatic conclusion of YEAR ONE, the Great Beast now roams the fractured United States of America. Deep into an all-consuming war between the splintered nations, the Four Horsemen move to further their individual agendas while resisting the inevitability of The Message.